Note the dark-rimmed opening between segments on back. 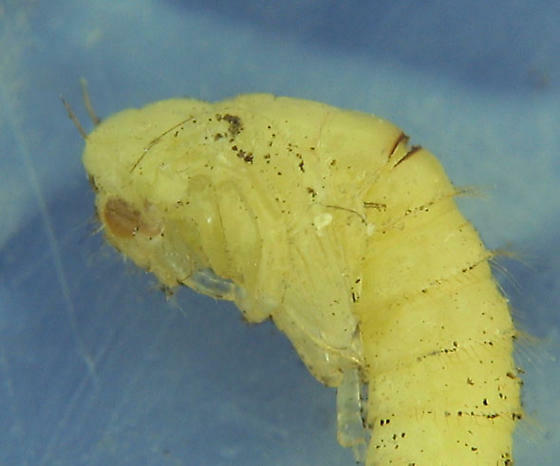 The dark areas on pupae seem to be where the skin is especially thick and hard, such as at the ends of horns, spurs, spines, lateral extensions, etc. that probably have both a defensive and mobility function. Here, if the pupa flexed backward, this slit would act like a mouth, clamping down hard on an assailant perhaps. Hinton, H. E. 1946. The “gin traps” of some beetle pupae; a protective device which appears to be unknown. Transactions of the Royal Entomological Society of London 97: 473-496. Pp. 485-6 specifically cover Ptilodactylidae.